In a multichannel system, no single speaker is charged with a more important mission than the center channel. Often carrying as much as 75% of a modern cinema soundtrack at any one instant, the center channel is the acoustical anchor for the entire system. 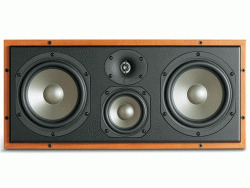 Which is why Revel created the Voice2 loudspeaker. Built with the same exacting standards for tonal accuracy resident in every Ultima2, the Voice2 enjoys an effortless command of dynamic contrasts, textural detail and resolving power. Revel Performa3 center channel loudspeakers feature flexible placement options and sleek designs, allowing them to blend-in easily with your existing décor. They deliver an impressive combination of uncompressed dynamic range and low distortion across the entire audible spectrum. Quite possibly the most important component of a multichannel surround sound speaker system, the center speaker provides most if not all of a movie’s spoken dialog, as well as music and sound effects, and is equally critical with multichannel surround mixes as well. The Concerta C12 center loudspeaker is designed to ensure that everything in the center channel is audible and consistent over a wide listening area, with exceptional dynamic range with no audible compression during high volume passages.